It was just a few short years ago, that Close-Circuit Television (CCTV) surveillance camera systems cost thousands (and sometimes, tens of thousands) of dollars. These surveillance systems were essentially stand-alone systems with little or no networking capabilities. In fact, if remote monitoring was required by these earlier camera systems, a separate, dedicated high-speed network was required to connect these systems with a central monitoring facility. Today, the microprocessor-based CCTV camera systems we recommend are inexpensive, ease to install, and can be managed remotely with Internet-connected computers, tablets, and even smartphones. They can be installed indoors or outdoors using tamper-proof mounting brackets. We Can Integrate Your Surveillance Cameras Into Your Existing Network. tablets, PDAs, and smartphone attached to the Internet. The IP camera systems we recommend include up to 16 indoor and/or outdoor color cameras that can be controlled by user-friendly, intuitive software running on one your existing computers. When motion is detected by any camera attached to the system, it sends an alarm and a video clip that includes live video of the person or thing that activated the camera's integrated motion detector. Additionally, an Email message containing a still photo of the event that triggered the motion detection can be sent to any Email address on the Internet. After this Email is delivered to the specified address, the person receiving this Email can then open an Internet browser window and view the video being captured by the camera in real-time. It is important to note that this video can be viewed on a PC, a PDA or any video-enabled mobile phone. Our IP camera systems include sophisticated security protocols to ensure that this surveillance video is only viewable by authorized administrators and users. See who entered or attempted to enter your SOHO or small business when you were closed. Provide multiple levels of security for access control (an administrator and one or more users). Monitor on facility while on vacation or out of town on business. Monitor empty, unused portions of your facility. Provide off-hours security surveillance for small business. Archive surveillance videos on DVDs or other inexpensive storage media. Connect your surveillance to your broadband network. Receive Email notifications that contains a still picture of the person or thing that activated the motion detector. Monitor live video on your remote PC, PDA or video-enabled mobile phone. Move individual cameras or the complete system to different locations. How much does a typical DVR-based CCTV camera system cost? a top-of-the-line sixteen camera system with DVR and monitor with advanced features such as two-way audio, pan/tilt/zoom, surveillance patrol, and night-vision, can cost $3.000 or more. 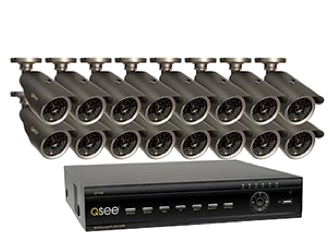 Fortunately, most DVR-based CCTV surveillance camera systems are both modular and flexible, and thus, you can initially install a modest four-camera system, and add additional cameras as needed.